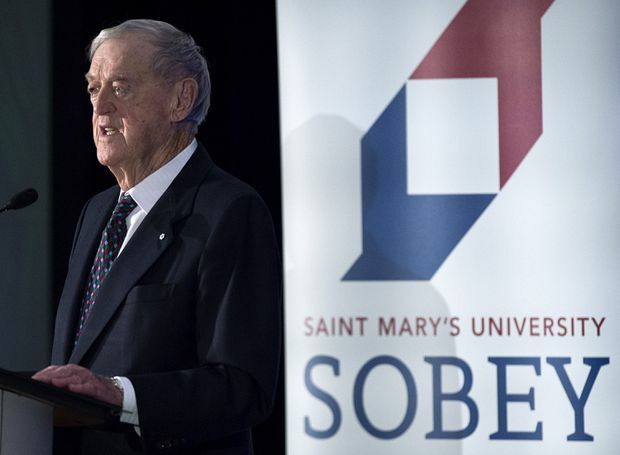 David Sobey announces that the Sobey family empire is donating $18 million to Saint Mary's University at an event at the school in Halifax on March 21, 2019. The Sobey family empire has donated $18 million to Saint Mary’s University — the single largest gift in the school’s history — aiming to boost business education in Atlantic Canada and position the Sobey School of Business among the country’s top commerce faculties. Paul Sobey, Saint Mary’s outgoing chancellor and the former head of Empire Co. Ltd. — the Stellarton, N.S.-based parent company of Sobeys Inc. — said the family remains committed to the university. The money — the largest gift in the institution’s 217-year history — will go towards attracting top students to the school’s commerce program, expanding its faculty, and a new building dedicated to entrepreneurship and innovation. In 1992, the commerce faculty was named after Frank H. Sobey -- renamed the Sobey School of Business in 1997 -- and in 2015 the David Sobey Centre for Innovation in Retailing was established.